SnapCacklePop: Green Day confirm three new albums..! Green Day confirm three new albums..! Those American Idiots Green Day have comfirmed they are currently in the studio recording not just one but three albums! 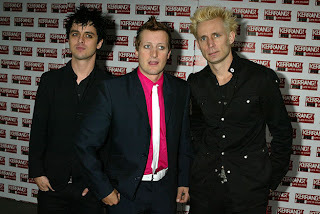 Yep not content on producing one, the band are releasing a trilogy entitled ¡Uno!, ¡Dos!, and ¡Tré! – that will be released in September 2012; November 2012 and January 2013 respectively. The albums are the follow-up to the Grammy award-winning 21st Century Breakdown, and are being produced by the band’s long-time producer Rob Cavallo. ¡Uno!, ¡Dos!, and ¡Tré! are being recorded in their hometown of Oakland, California. “We are at the most prolific and creative time in our lives. This is the best music we've ever written, and the songs just keep coming,” said the members of Green Day. “Instead of making one album, we are making a three album trilogy. Every song has the power and energy that represents Green Day on all emotional levels. We just can't help ourselves... We are going epic as f*ck!" At SCP we love a bit of Green Day and this was a moment we fell in love with vocalist/guitarist Billie Joe Armstrong, bassist Mike Dirnt, and drummer Tré Cool that little bit more..!